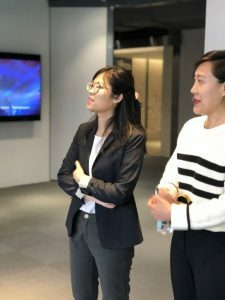 The Center for Digital Strategies offers an MBA Fellows program for second year students looking to expands upon their understanding of digital strategies and the impact of technology on the future of general management. The program consists of a diverse mix of students from a wide variety of backgrounds to enhance peer-to-peer learning. Students are challenged to grow via hands-on learning opportunities, build their networks, and share their knowledge with the CDS community. The program is highly competitive, with selection for the program open at the end of the winter term and is open only to second-year students. Connect to a Powerful Network – Join our powerful network of alumni, faculty, and global leaders with deep expertise leading in the digital age. The center’s vast, and diverse network allows you to connect with thought leaders on the front lines of the digital age around the globe. Learn by Doing – Unlock the knowledge you’ve gained at Tuck via corporate-sponsored experiential learning projects, global learning deep dives, and visits to technology and digital companies. Partner with leading digital firms to create highly connected, personal, and transformational experiences working on digital projects. Contribute to the Tuck Community – Join your peers for networked learning sessions focusing on current issues that matter to you. Share your knowledge and expertise with the wider Tuck community and build your brand as a digital leader in the Tuck community. Acquire and Hone Business Skills – Take advantage of opportunities to acquire and hone both hard and soft skills through the center. Fellows work with the center team to learn research, business writing, public speaking, negotiation, digital marketing and analytics, and other important skills needed in today’s fast-paced business environment. If you find yourself wanting more access to digitally-savvy executives, seeking a community of diverse perspectives, and looking for opportunities to apply what you’ve learned in a digitally-focused environment, the CDS MBA Fellows Program might be a good fit. For more information, please contact Patrick Wheeler.